Unlike dogs, cats have a reputation for being solitary, independent animals, who love nothing more than doing their own thing. While some cats unequivocally prefer living a solitary lifestyle, others can actually thrive in an environment with another feline companion. At the beginning of this month our Campaspe and North Melbourne shelters were overrun with 135 cats and kittens up for adoption, and many more patiently waiting in the wings for their turn to find their forever home. With so many fabulous felines in our care, shelter staff began to notice a few were actually “feline friendly” – that is, got along with other cats. These sociable cats were encouraged to share our larger condos to help comfortably accommodate more cats and kittens. Cat owner and our senior veterinarian Dr Alan Bolton, said for some cats, having another furry feline friend to socialise and play with can help fill their day when they are home alone. “A common myth about cats it that they prefer to live alone, but this is not necessarily true. Cats can actually form bonds, not only with other cats, but with other animals as well. “However, if you are looking to introduce a new cat into a home with an established cat, take your time to research ways to introduce new cats to each other and be realistic about the amount of time it may take for your cats to become used to each other,” said Alan. After spending some time together in our larger cat condo, interesting things began to happen, with some of our condo companions starting to form bonds with one another. Feline fan and member of our cat shelter team, Alison, said two condo companions, eight month-old Cauliflower and one year-old Reginald are just one duo who have hit it off. 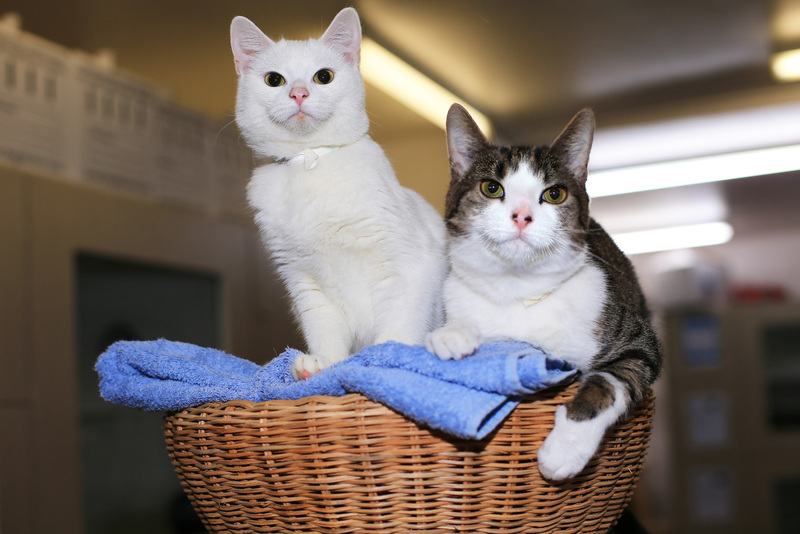 “Both cats are naturally friendly and easy-going and are open to sharing their space with others. “Before coming into the shelter these two didn’t know each other, but two weeks ago we placed them into a condo under close watch and found they not only got along, they actually bonded! “Now they are great friends who love each other’s company. “Both Cauliflower and Reginald have been up for adoption for more than 50 days. It would be great to see both cats find a loving home together, where they can play with each other. However, with their easy going natures, they will also be adaptable in homes with other pets.